PART I. Preface (I.H. Iversen and K.A. Lattal). Foreword (M. Sidman). List of contributors. Chapter 1. Subjects and instrumentation (N. Ator). Chapter 2. Response acquisition (S. Gleeson). Chapter 3. Scheduling positive reinforcers (K.A. Lattal). Chapter 4. Experimental design in the analysis of free-operant behavior (M. Perone). Chapter 5. Avoidance and punishment (A. Baron). Chapter 6. Choice (J. Mazur). Chapter 7. Stimulus control (J.M. Harrison). Chapter 8. Conditional stimulus control (H. Mackay). Appendix: APA guidelines. Subject index. PART II. Preface (I.H. Iversen and K.A. Lattal). Foreward (M. Sidman). List of contributors. Chapter 1. Time as a variable in behavior analysis (A.C. Catania). Chapter 2. Behavioral pharmacology (M.N. Branch). Chapter 3. Behavioral neurochemistry (J.E. Barrett). Chapter 4. Behavioral ecology (E. Fantino). Chapter 5. The use of computers in the control and recording of bahavior (L.R. Gollub). Chapter 6. Methods of analyzing behavior patterns (I.H. Iversen). Chapter 7. Mathematical description of operant behavior (R. Shull). Glossary (A.C. Catania). Appendix: APA guidelines. Subject index. This volume is dedicated to the late B.F. Skinner as a tribute to his pioneering work on the Experimental Analysis of Behavior. This science that he initiated studies the behavior of individual organisms under laboratory conditions. 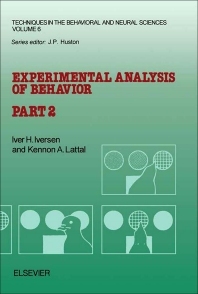 The volume describes a broad collection of representative and effective research techniques in the Experimental Analysis of Behavior; techniques derived solely from infrahuman subjects, which have been selected both for their utility in behavior analysis and for their potential value in expanding the use of behavior analysis in the neurosciences. By bringing together under one cover the expertise of individual authors regarding techniques based on their particular laboratory experiences, the book provides an informative and practical source of methods and techniques for those practising or interested in Experimental Analysis of Behaviour.